When it comes to interior design, what is old is new again, and mid-century design has certainly made a fierce comeback. Flip through the latest issue of any home decor magazine and you’re likely to come across articles and spreads featuring mid-century furniture or art. Browse through the website of any furniture retailer and you’ll find the iconic designs of Herman Miller, George Nelson, and other famous designers being replicated. This era of design was born around the 1940’s and continued into the 1960’s. People wanted to simplify their lives because there were minimal resources, so designers became innovative out of necessity, creating furnishings that were organically shaped with smooth, clean lines. The term “mid-century modern” was coined by Cara Greenberg in 1984 when she wrote Mid-Century Modern: Furniture of the 1950s. Some of the more notable pieces that came from this era include George Nelson’s marshmallow sofa for Herman Miller, the sunburst clock by Howard Miller, and the Eames lounge chair designed by Charles and Ray Eames for Herman Miller, just to name a few. Those of you regular buyers in the The St. Vincent de Paul Specialty Auction may have noticed that more and more mid-century furniture is being offered in the auction that takes place every two months. This upcoming Specialty Auction that closes on October 22 is no exception. That’s why we want to share some examples of this style that we came across that may inspire you to incorporate some pieces into your current design or may have some of you wanting to redesign the whole house! Here’s an eclectic mid-century design by Janel Holiday Interior Design (via HomeAdore.com). If you like minimalistic, clean lines, you’ll like this apartment designed by Koj Design (via Home Designing). The gallery art wall adds character and personalization to the room. Many mid-century interiors feature neutral palettes and plenty of light and space. Liana over at Froy Blog says that when picking colors for your interior, remember to use the 60-30-10 rule, which means that the room colors should be 60% dominant base color, 30% secondary color, and 10% accent color. 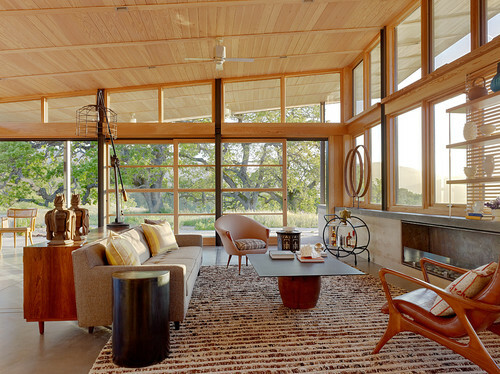 Here are more tips from Freshome.com to add mid-century style to your home. If you are a fan of mid-century furniture, you definitely don’t want to miss the upcoming St. Vincent de Paul Specialty Auction. There will be vintage chairs, black leather chairs by Knoll, tables, and lamps that you will want to bid on. Remember that proceeds from the auction go to help the homeless in San Diego. Browse the catalog here.